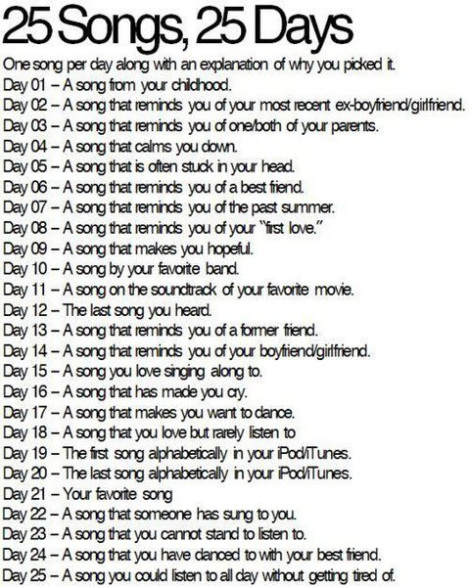 Day 25 – A song you could listen to all day without getting tired of. I made it! 25 days of nonsense! Sorry for foisting that on you, dear readers. I know these music posts can get a little tedious, especially when I do 25 of them in a row. Anyway, a song I could listen to all day. Dammit, I already used Beethoven’s 9th for one of the answers. Well, crap. I am a huge fan of full shuffle. I can listen to my music library for two months straight without hearing the same song twice, so the concept of listening to the same song all day is a little foreign. I get on kicks where I want to hear the same artist, but rarely do I listen to the same song more than once in a row. Sometimes, very occasionally, I will listen to a song and then hit the back button to listen to it again. That’s pretty rare though. The only example of a song that I tend to listen to at least twice whenever it comes up on shuffle is Godspeed You! Black Emperor’s Moya. The other day, I mentioned post-rock as a genre I love and listen to a lot in the morning while waiting for my brain to thaw. This is probably my favorite post-rock song. Just put it on and listen to the entire 10 plus minutes from start to finish. It’s worth it. The way it builds and builds gives me goosebumps. It’s absolutely breathtaking. I listened to the entire 10 plus minutes from start to finish. It was worth it. But I don’t think I could listen to it over and over again without getting tired of it. Well, I would have a hard time listening to any song all day. Twice I can do though. O Rio Amazonas from the album Manaus Where Two Rivers Meet is my choice. The saxophone is a killer. Just love it. This song is beautiful. I could listen to it 130+ times in a row. YAY for Moya! Still twinz.